Gladiator is a Film programme that first aired in 2000 and has been classified a 15 certificate. 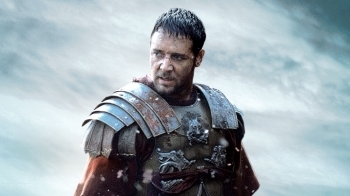 One of cinema's most spectacular films, both on-screen and in box-office returns, Gladiator won five Oscars and was nominated for a further seven. It made Russell Crowe, already a star, one of Hollywood's top names and rightly saw him win the Best Actor Oscar, but it was to be Oliver Reed's last film (many thought he, rather than Joaquin Phoenix, should have been nominated for Best Supporting Actor). 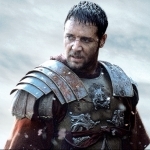 Crowe plays General Maximus, Rome's greatest general under Emperor Marcus Aurelius (Richard Harris). Having defeated the tribes of Germanicus, the dying Aurelius bequeaths Maximus the title of Protector of Rome, turning it into a republic, but Auerlius's son, Commodus (Phoenix) is determined to seize power. He orders the death of Maximus and his family and while the General escapes, his family is slaughtered. Using a mix of CGI - to re-create the battles, gladiatorial fights and the glory of Rome in general and the Coliseum in particular - and a stellar cast, Ridley Scott (nominated for best director) delivers a film that is full of action but balanced with "quieter" moments of plot development. Phoenix in particular gives one of his better performances as a corrupt, venal Emperor who is a product of his father's lack of affection rather than deliberate malice, and Reed, with many of his scenes digitally restored, is genuinely touching as the man who becomes Maximus's mentor. But it is Crowe who steals the film, brooding, wracked with grief and revenge yet certain of himself and the right he must do for himself, for Aurelius and for Rome.